Everybody loves dip; not everybody loves everything that goes with it. Carrots and cauliflower pieces are often passed by for a pretzel stick or some kind of chip. In the end, salty and starchy wins over healthy and natural. However all that reaching over the veggies is sure to cause some sort of guilt trip. Better to just spin them out of the way altogether. 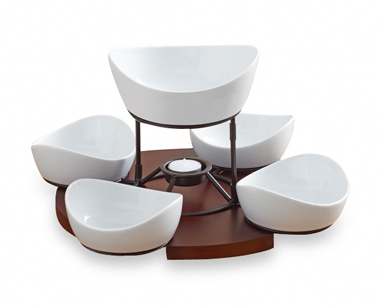 The B. Smith Lazy Susan with Serving Bowls Set features a revolving base allowing for the best snacks to always be within reach. The four porcelain serving bowls each hold 11-ounces, while the top large bowl hold 21-ounces. The bowls are all microwave, oven and dishwasher safe so clean up and prep is a breeze. A small tea light in the center helps to keep the dip warm, no matter how many broccoli florets get passed by.